Bees have inhabited the earth for millions of years. Entomologists (scientist who study insects) have studied fossilized honey bees, preserved in amber, which are dated around 100 million years old. The honey bees they have found have changed very little since then..
Human beings have long known the wonders of honey, it was the primary sweetener. Farmers in the 18th century recognized the value of pollination by bees; their crops enjoyed dramatic improvement-more & larger flowers, fruit & vegetables. 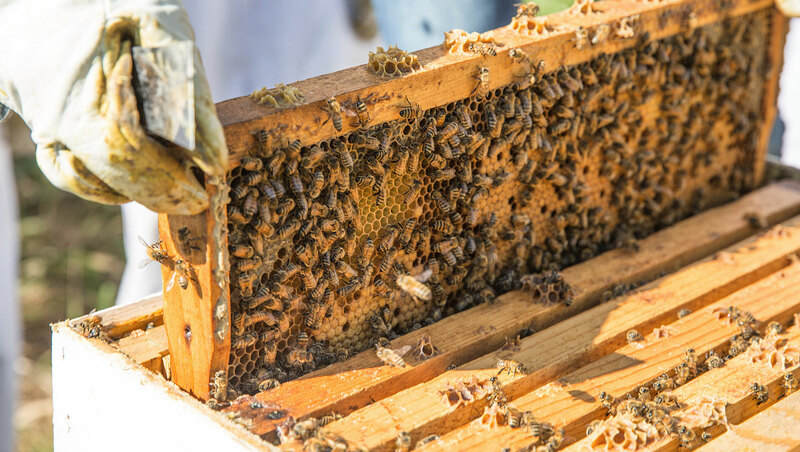 In North America, approximately 30% of the food we consume is produced by bee pollinated crops, and generates sales in the area of $16 billion in the US alone. Steffi needed a source for local honey to sell at Green Goddess Grange. Local bee keepers Bee Ge La Apiaries befriended her, and introduced her into the fascinating world of the honeybees. 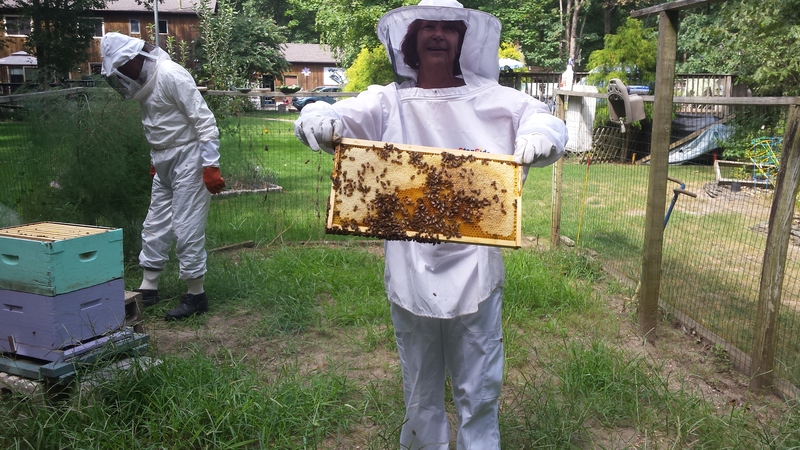 After several years of reading up on apiculture, taking a beginner course & listening to stories from other bee keepers, she started with 2 hives in 2016. One hive didn’t survive the installation, perhaps their queen died & they swarmed away. The other hive survived its’ first winter. For 2017, 2 more hives were added for a total of 3. As of the end of June, one is thriving, but one has lost their queen, & a NUC has recently been installed. Honey will be harvested in July, and available for sale. At the present time, local honey from other apiaries is on hand at all times. Numerous different infused honeys are offered as indicated below. 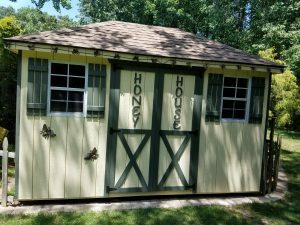 In 2018, 3 more hives were placed at a friend’s yard a mile from Goldenacres. 1 hive swarmed, but the other 2 hives are busily preparing for the winter. There are 3 hives at the original sites & we look forward to a small honey harvest in late August.